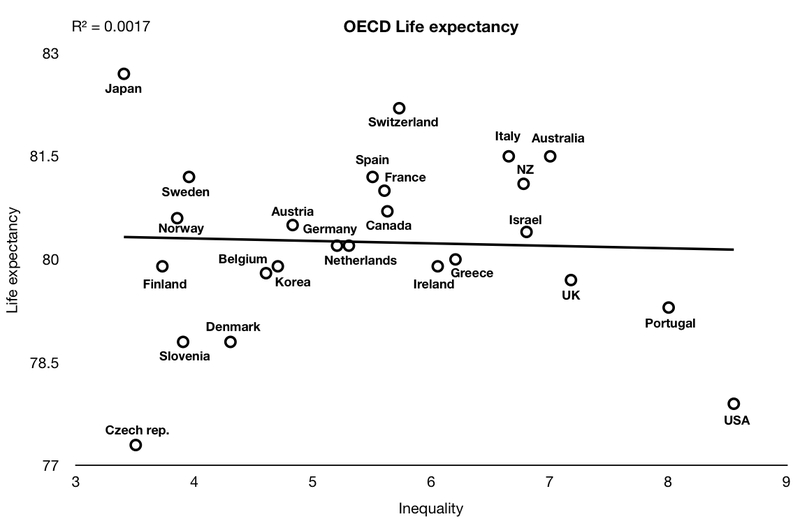 Velvet Glove, Iron Fist: Does the Better Life Index support The Spirit Level? 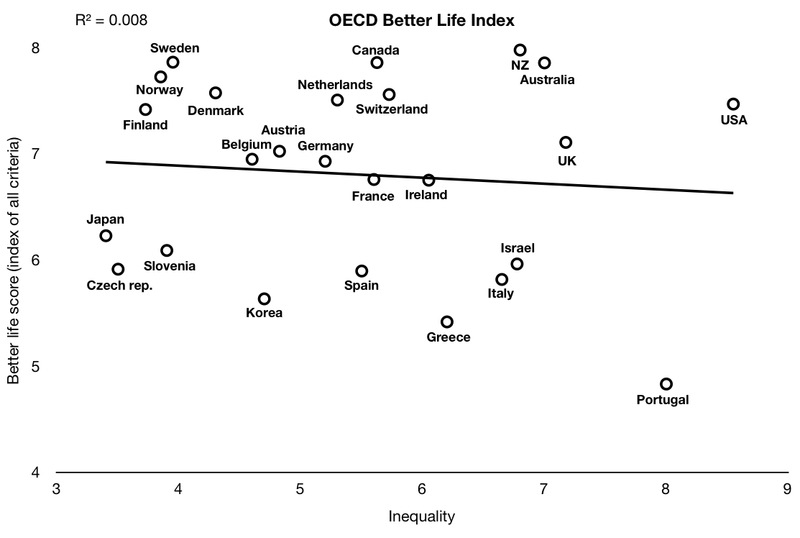 Does the Better Life Index support The Spirit Level? 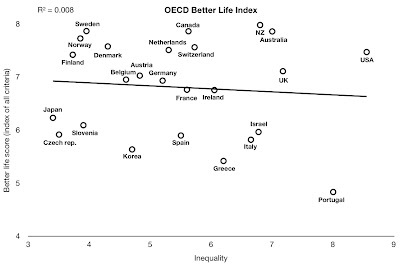 Yesterday, the Organisation for Economic Co-operation and Development (OECD) published the Better Life Index. 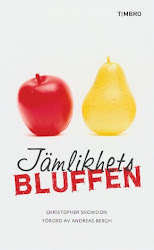 This project aims to measure the quality-of-life in countries using eleven criteria. Since it was founded in 1961, the OECD has helped governments design better policies for better lives for their citizens. 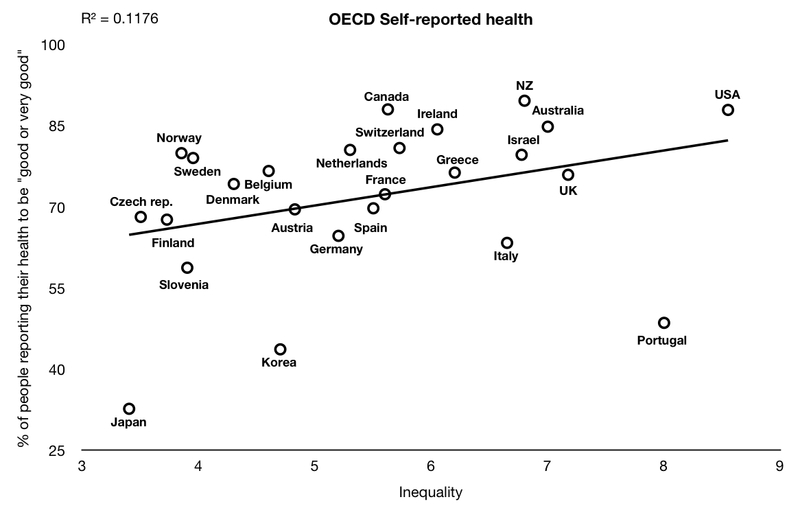 More recently, the OECD has been keenly involved in the debate on measuring well-being. 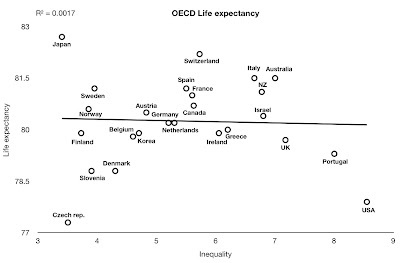 Based on this experience, these 11 topics reflect what the OECD has identified as essential to well-being in terms of material living conditions (housing, income, jobs) and quality of life (community, education, environment, governance, health, life satisfaction, safety and work-life balance). 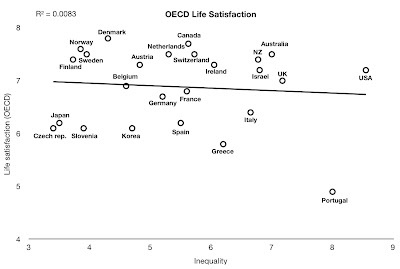 Having gone to all this trouble to create a reliable index of well-being, it's worth asking whether the OECD data supports The Spirit Level's hypothesis that "more equal societies almost always do better"? No, it doesn't. 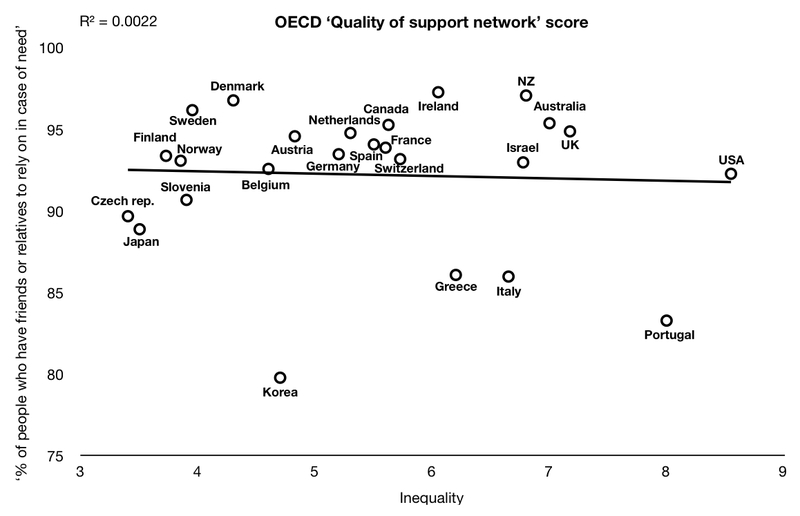 The poorest country—Portugal—does worst, but the data points appear to be scattered randomly. 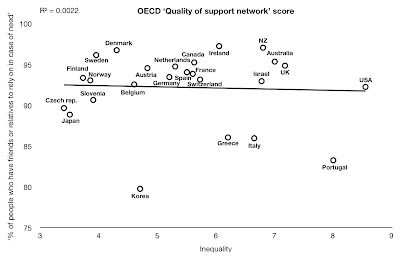 In fact, if we drill down into the data we can see that not only is well-being not better in "more equal" countries, but the OECD's figures do not support The Spirit Level's key argument—that "more equal" countries have stronger social support networks which lead to a healthier and happier population. 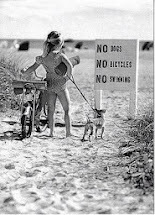 There is no association between inequality and any of these variables. 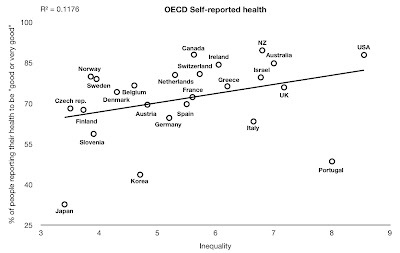 Indeed, with the exception of self-reported health—which seems to show the opposite of what The Spirit Level says—the regression lines are about as straight as you could expect from a randomly assorted set of data. There is no evidence for an explanation sometimes proffered for the apparent paradox of increasing incomes and stagnant life-satisfaction scores: the idea that an increase in someone’s income causes envy and reduces the welfare and satisfaction of others. 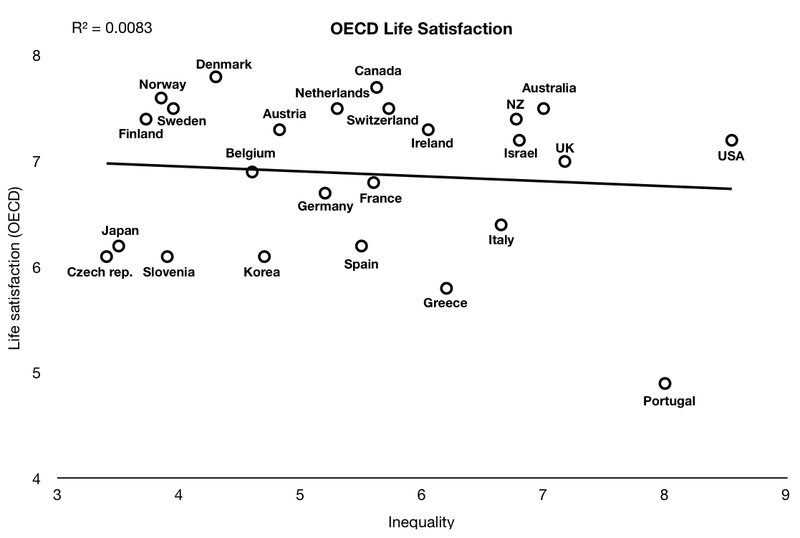 In our estimates, the level of income inequality had no impact on levels of life satisfaction. 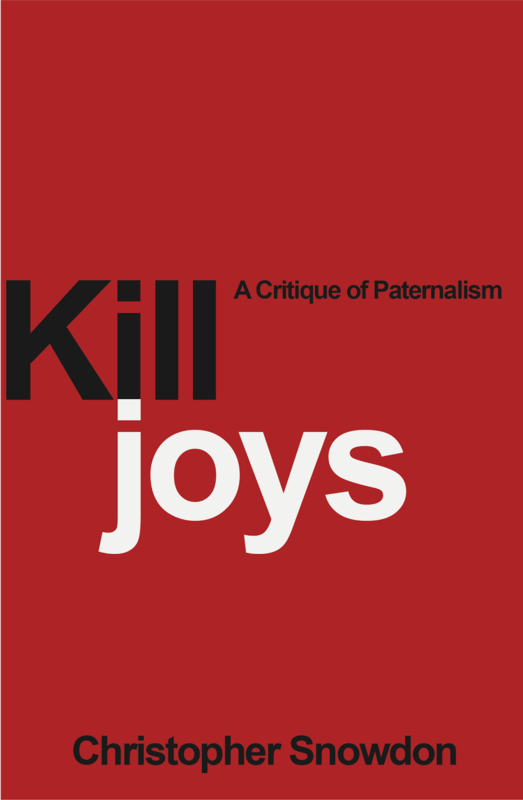 Life satisfaction is primarily determined by absolute, rather than relative, status (related to states of mind and aspirations). Excellent work - good show. 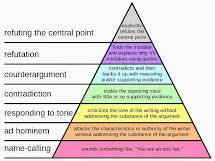 Australia - what went wrong?